The Times of India being the third -largest newspaper in India by circulation and largest selling English-language daily in the world.This is the second-oldest Indian newspaper still in circulation.BBC ranked The Times of India among the world’s six best newspapers.With such a huge circulation,advertising in Times of India is of great advantage to advertisers.It is the most influential newspaper and long standing leader in the print business. 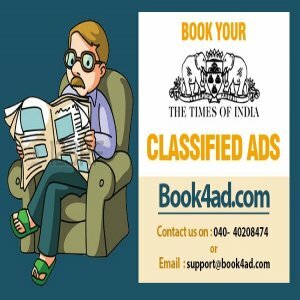 You can book Times of India classifieds advertisements online through book4ad,which is a highly reliable online newspaper ad booking agency. You can view the Times of India e paper online in our site book4ad. We are the leading online ad booking agency assist you to advertise in all the leading newspapers in India.Our aim is to make advertising easy, and hence help you through out your ad booking process. You can book Times of India Classified online via book4ad. 1.It has huge circulation and reach as compared to other leading newspapers. 2. Being one of the leading Advertising Agency we have a tie-up with of India property Tabloid which enables us to offer better discounts and Tariff rates. 3. Advertising in Times of India property Tabloid newspaper gives you good response and you can reach your targeted readers effectively at reasonable cost. You can even book Times of India Property Tabloid ad at low rates,through our website. 1. Choose the Ad Type – Classified ads, Classified Display ads or Display ads according to your requirement. 2. Select the category type from the listed options and draft your ad using ad samples as reference. 3.Select the city from the dropdown menu and in the publications select Times of India from the listed options or you can directly select Times of India and opt for the editions. You can track the status of your order by checking in My accounts in www.book4ad.com. You can also call us or chat with us at :9030119494. For any queries send us email at:support@book4ad.com.